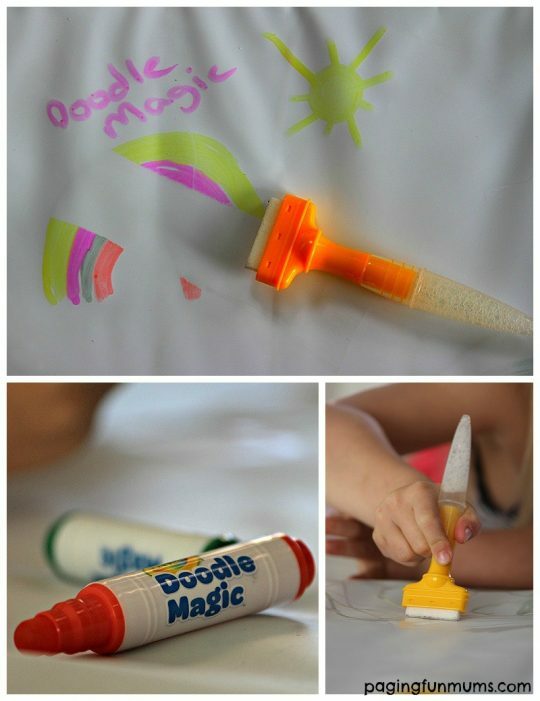 We love to get creative with our Doodle Magic Mat from Crayola! It’s the perfect Art kit with ZERO mess! The best part is not when the children create their artwork…it’s watching their faces light up whilst they spend an equal amount of time making it magically disappear using their Magic Eraser! Watch this snippet of video of Miss 5 demonstrating here via Instagram. The Doodle Magic Mat is handy to take in the car, or on a plane trip – eliminating the need to pack pencils and an endless supply of blank paper! It does say NOT to use these pens on painted walls… BUT I couldn’t help myself (don’t tell my husband OR the kids) I drew on our walls! You can watch my test video here via Instagram. 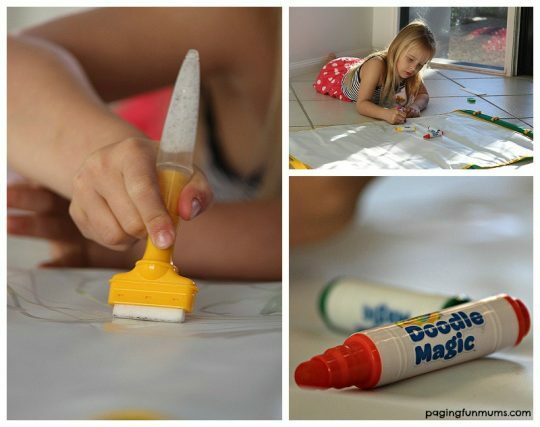 You will never have to worry about mess with these Magic Doodle Markers! We think this is a great product and excellent value for money – especially because it can be used and re-used again and again! It’s a great size for siblings to share so they have plenty of room to create a masterpiece together – first time there was ZERO fighting for space from my kiddos. You can buy them here in Australia from Toys”R”Us, Selected Toyworld stores and BigW (keep an eye open for their HUGE TOY SALE starting soon too!). Or you can head to Crayola’s Website to read more information about this cool product here. We have updated this post to show off the new and exciting Crayola Doodle Magic Travel Packs! These are mini versions of the one shown above making them the perfect addition to any travel journey or a great option when space is limited! You can watch their Product Video via YouTube here. 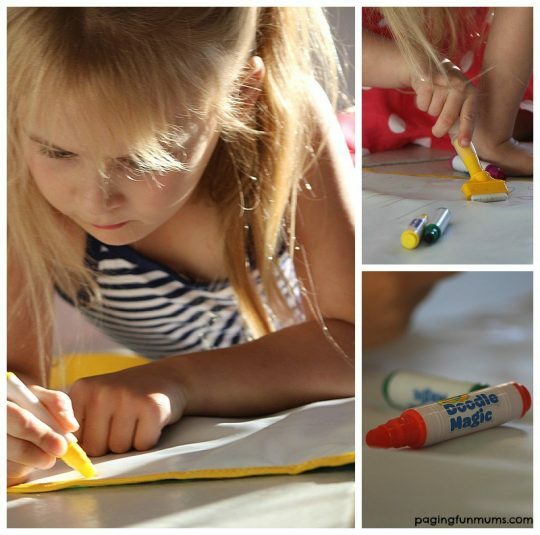 Our lovely sponsors at Crayola have kindly given us 12 Doodle Magic Travel Mats to GIVEAWAY!! We thought they would be a great addition to a playgroup or school, so we’ve decided to give all 12 away to ONE lucky winner! In the hopes they gift them to their local school or playgroup :). Entry is FREE and easy! Simply click on the image below to answer a quick question and complete your entry details. Good Luck Fun Mums!! I love watching my daughter draw and seeing how creative and free spirited she can be. I like watching their picture grow, as they age. DS 15mths I love watching him create colour and watch for that one day when it will turn into something deliberate. My daughter would love one of these as she has just began to learn to write letters and numbers and loves that fact that she can erase her mistakes and can alter her drawings without having to chuck the whole picture away saying I’ve ruined it mummy! I love the imagination that flows & the exciting stories that are told with the pictures by the little ones as they draw. I have four kids and they all love art and music so much! I love watching them draw because all four of them have such different imaginations and somehow they always incorporate me in their drawings, even if sometimes look like a fish with a tree for a head! And this of course, means WAY less cleaning up after the arty sam in my kids have taken over for the day!!! My 5 y/o understands pictures can create stories and my 2 y/o loves to scribble and try to be like her big brother. They encourage each other with imagination. I love watching my 5 yr old grandson draw. I can see a real talent. I’m always amazed at his creativity. I love watching the concentration on my 19mth olds face as she experiments with the different colours, and her fascination in using different hands and grips on pencils, etc. I love watching my family day care children (9) engaging discussions and excitement , whether it is just a two colour line to a very colourful imaginative art work! My little boy is 5 and autistic. He’s always in trouble (by me) for drawing on furniture. I think he would absolutely love this. Watching the children express themselves on paper is quite magical, the concentration on their faces and their imagination is just wonderful to watch. I love the expression on my 5 year old’s face when he’s drawing! He’s very serious and takes his time so that he gets it just right. I love watching my 19mth old learning how to use textas to draw even if she does have a habit of drawing on my walls. I adore watching my children draw as their imaginations grow. Picasso’s in the making. I love watching my daughter draw recently she’s drawn turtles and ladybugs that are really really good. I love watching DS 22 months drawing and using his imagination. He loves drawing with others and tries to copy what they have drawn. Tractors and cows mostly! I love watching my 19 m/o daughter scribbling lines and telling me she’s drawing a ‘circle’. I love seeing how their drawing evolves, my youngest has finally started on head, no arms/legs yet but can’t wait to see the details! Watching my 3 year old and 15 month old imitating her is precious. I love watching the sheer delight and hearing him squeal with excitement when’s son is scribbling ! Each colour excites him as much as the one before . A simple pleasure to watch. I love watching my daughter draw, she has such an amazing imagination!! I just love watching there little faces and the way there minds are working being creative and learning. Love watching my granddaughter draw, the young ones are so imaginative and see things in thier pictures that we can’t. I just love watching my 2 yr old daughter draw, to see her imagination run wild and to express freely the new things she’s learning, it’s mesmerising . would be awsome fun ! I love watching & listening to the kids making up their stories of what they are drawing – their imaginations are unlimited. They are beautiful drawings. I love seeing the world from their point of view. Amazing what they notice! I love watching my son draw. Hes got an amazing immagination for a 4 year old. He draws the most gorgeous pictures. The imagination of my 3 year old is amazing and watching it come to life through drawing is a true gift. I love see my little girl’s face light up each time she draws something new. Drawing can bring so much joy with very little needed. I love how creative my kids can be over and over with one toy. The possibilities are endless. Love watching his development and teaching his little brother how to draw. My daughter has only just started to draw, I love watching her swap hands and change grip, find different colors and be fascinated by the crazy scrawl that she creates. I love to see how my daughter advances in her skills and how excited she is to show me something she has drawn or colored. Seeing her drawings progress as she gets older. I now get drawn as two big googly eyes and a massive circle for my head. I love watching my children pictures change as they develop and what they can think of with such amazing imagination it’s beautiful. I love to make my son smile with the reactions to his drawings. He gets so proud and shows me every mark he makes. My 3yr old boy loves showing me all his wonderful creations. Mr 2 loves to copy what mr 3 is doing and miss 1 is amazed at the marks left on the paper. I love watching the look of concentration on my daughter’s face and the songs she sings as she draws – pure sunshine! I love to see them take their thoughts and feelings and wishes and share them with me and have fun doing it. My son loves to draw complex houses and rocketships. I love watching my son’s imagination go wild! My 3yo tells stories while drawing. I love having inlets into his imagination as his illustrations develop, and getting to explore his worlds with him. Magic! This would be awesome! I love seeing my children draw pictures of our family. Sometimes we get super powers and the reasons why we are given those super power are super hilarious! Drawing makes my sons imagination shine through. I love watching my granddaughters (4 &5) as they create with colors, whether it is pencils, crayons, paint or whatever else they choose. Their imaginations are endless. I absolutely love how my kids can play and enjoy a good time and I don’t have to stand right over them making sure they aren’t making a mess. So it gives them the freedom of choice and me the relaxation to let them play. its great for all of us and I cant thank you enough! I love knowing my toddler’s favourite colors and doodles and how she sings twinkle twinkle little star when she draws a star.. I love seeing their creativity flow on the paper, and to get a glimpse into the minds of the children and know what they are thinking. Our toddler has really bad fine motor skills for his age (according to the MCHN) so I love encouraging him to draw so he can improve on it. Love seeing there chubby little hands holding crayons and the expression on their faces as they doodle. I love to see my daughters point out things and then draw them on thier boards. Its fun to watch them play and share. I love how they advance form stick people to sausage people. These sketches are always adorable. Adding extra features as they get older. It’s that first stick man, with the really big head, lopsided eyes, messy hair and that awkward looking body and they say “look mummy it’s you” and in some kind of weird way it actually resembles you.. These treasured moments make it all worth while! How his drawings have a ‘Dali’-esque quality to them… they’re “Surreal’ thing! I love seeing them put their imagination into their drawing. Fabulous prize…my Granddaughter would be kept amused for hours! Love seeing them at the end of the drawing when they hold it up with the biggest smile on their faces. My husband is an artist and I am excited to think that he can soon share his love of drawing with our son! My little girl is just starting to like drawing and asks to draw all the time – she loves drawing shapes. This would be AWESOME! Because my 2 year old finds permanent markers and pens for the walls, herself and anything else she can draw on. No stains…nice! Love seeing him hold different stuff in his hand with different shapes and sizes. Love the fact that my children use their imaginations and draw what the want. As much as I love reciving endless drawings of me, my name, rainbows and fin and jake from my children there is only so many places to hang them just saying this mat would come on handy!! I love that when drawing it’s a picture of one thing and by the time mum comes to pick up it’s something else. I love to see how my grandson who is only 21/2 tries to draw his representation of his wonderful imaginative stories he creates. His facial expressions are priceless and he tells the story as he draws. I have used crayola products for many years and I get as excited as he does as we try their new products all the time. My son is 2 and has gone from lines, to circles, to zig zags! Can’t wait to see his drawings change and improve. My son is 2 and he just loves it! Everything looks like a squiggle but he loves telling me in detail what the pictures are and what the animals or people etc doing! He’s stopped drawing on the walls thank god! My daughter loves drawing now that she is getting older. Her pictures are changing and getting clearer about what they are. She would love something like this. Even her baby sister could get into it. I wish I had seen these when she was younger though, because our walls on our flat have very kindly been scribbled on by her. I love watching my 19 month old daughter get excited about drawing eventhough she only draws straight lines. We have lots of paper with lines. I love seeing their sense of achievement. And I love being surprised, each and every time, by what they draw, how well and how inventive they are! Tiny genii! What I love about my kids drawing….I get to see the absolutely wonderful, funny, imaginative and inspired visions that are inside my children’s heads and hearts. It makes my day to see them express themselves and have so much fun doing it! Just wanted to share since not being in Australia I can’t enter your contest. I love the imagination and thought that creates the end result. I love watching my kids individuality bursting from each picture they draw. Details I’d never even consider, they include. Some very funny! My daughter is learning to draw. Her creativity and detail is amazing!! Such a great outlet and so much fun for her big kid mummy!! I enjoy seeing my son create his own creatures and places with his amazing imagination. Always something different! Love seeing my grandchildren happily doing there artworks and excitedly telling what there’ve drawn then sticking them all over my fridge. I love to see my kids drawing because it is such an expression of their imaginations! My 5 year old autistic daughter blows me away when I watch her draw and colour! Her precision and perfection is AMAZING! She would love this. Seeing the end result, as it’s never like the picture ever starts out. The intent patient look on their little faces as they make the most of my Derwents, paints, and ‘special’ paper. Seeing their imagination being drawn onto paper! I love how our wee man grabs crayons in his fists and taps away on the paper. Also how he checked if they were edible!! I love watching my daughter draw dinosaurs, and pictures of her family. She is quite the crafty one. As mummy’s putting it straight on the fridge!! Love seeing my kids excitement at my reaction when they have drawn a great picture. Proud as punch! Makes their day, & mine. I love that no matter how wonky that rainbow is, or how like a monkey that car looks, the kids think they’ve done a great job – and they have! I love watching my son draw and watch all his friends and magical world in his imagination come to life on the paper. My son doesn’t speak yet so I love watching him enjoying expressing himself in other ways, and getting messy as he does it! My Daughter is only 2 so it’s not actual pictures yet but more colour exploration. I love her look of accomplishment once she’s finished colouring! I enjoy seeing them having a great time, while I can have some downtime! My brother is an artist & I can’t draw for peanuts, so I watch eagerly to see if I have a Michelangelo. I love watching my girls do activities together, they praise each other’s good work! Their imaginations come to life! I love how they started with squiggles and progressed to stick people they have now progressed to actual person outlines its so amazing seeing how we all look through their eyes! I love competing with hubby to see who can decode our kiddo’s drawings! I love that my daughter gives me a crown in every picture she draws, and calls me ‘Queen Mummy’. All hail the queen! I love seeing the kid’s perspectives on the world. Whether it’s a dog as big as a rainbow or daddy in his ‘cool hat’. I love watching my little girl make up a story about what she has drawn, and I love that she does that from scribble! I love seeing how they intemperate things they want to draw. How they see them, express it and how proud they are. Makes me proud too! I love watching their imagination at work, a black squiggle to me is really Batman to my 3 year old and he is extremely proud that we then put it on the fridge. Watching their imagination unfold is amazing and seeing how their drawing improves with detail and technique in such a short time. My son paints up, what he calls a ‘messy painting’ and when asked what it is, conjures up a story of his own and gives life to this painting. Love his creativity! Looking at her face while she concentrates on creating a new masterpiece is inspiring. Sometimes I even see her stick her tongue out a little bit too. I love watching my grandchildrens full concentration and their imagination when they draw, us adults can learn from the children. I love watching my grandchildren draw and creating there drawings. Most of all i love the looks of concentration on their little faces. Watching my little boy who has NEVER sat still long enough to draw, now 5, develop a passion for drawing, imagination & creativity developing! Watching their imaginations come to life, showing their expressions creatively. Always a piece of art to cherish. Having grandchildren has kept me young, sometimes i draw with them.I Love how they tell me there story about there drawing. Its almost like going to a psychic…..they interpret the world in a clean and defined manner…seeing things we cannot or will not. Love watching then listening to the great stories behind each drawing and realising each individual personality and each childs imagination. I love to watch my son draw, his scribbles have turned into fantastic pictures, he loves to draw sonic the hedgehog and dinosaurs. I love watching Ava draw our family,even if its only stick figures, we have hair & huge eyes,her drawings are beautiful. I love discovering a future Rembrandt…a special talent for seeing details that escape me, a unique way with colours and they way their interpretations reveal something of themselves to me!! That’s you finally get to see what’s going on in their little minds! A creative mind is a healthy mind. Imagination’s allowed to run wild, run for a lifetime of adventures. I love watching my daughter draw pictures of her uncle as they’re like caricatures and are scarily (and hilariously) accurate for a three year old! I love the discovery and sense of achievement and wonder in their faces as they enjoy their drawing and proudly to come to show it off to me! I love watching my children draw! It gives me an insight into how they view the world – the colour and wonder which they see in everything brings so much joy to the whole family. my little girl love’s to doodle and has a passion for drawing and art, Watching my daughter’s imagination & creativity come alive makes me extremely proud and she loves to see her art on the wall. I love seeing their interpretation of the world around them through their drawings. It’s the concentration too. There are times I can almost hear the mind ticking over. I love it how my children describe their emotions in drawings and words, they are so imaginative, pure and innocent and without sounding biased…..very, very talented! Made with love, always! Only by watching my kids draw can I get a glimpse into their dreams. One has sunny days and dogs. The elder loves his superheroes. I love children’s drawings. I feel that I am being transported into their world when I look at their creations. Each picture taking pride of place on my fridge. The out-of-proportion sizes, huge smiles, unusual body parts, flowers, animals make my heart flip flop. As they grow older and their world gets bigger it is wonderful to see their drawing develop and their repertoire increase. It is somewhat miraculous! sorry, a little sad as I’ve just realised that my comment is too long, please note my altered/ reduced comment – I wonder if children feel like this when they realise they cant create quite what they want to ?? I am transported into their world when I look at their creations; each picture taking pride of place on my fridge. They are somewhat miraculous! The facial expressions from big eyes to lip biting, while concentrating on what’s being drawn. Then the pleasure & proudness when explaining their drawing. As a Speech Pathologist, I always get the kids to draw while talking and building that initial rapport. The most fascinating is when I ask ok, draw everyone at home as animals! Let’s just say everyone is watching that paper waiting to see what they’ve been chosen as! Their minds are engaged and active, and I love seeing what they come up with next. I love the excitement as she tells you that she’s drawn Mummy or a frog which us actually a lovely arrangement of squiggles (she’s 2). I love to watch the pure joy & excitement in my daughter’s face while she draws! It’s amazing to watch her explore & create! They have lots of fun! And when concentrating they sing! At the moment I am loving watching my daughter’s pictures evolve from scribbles to recognisable images. It’s like getting glimpses of her imagination which I adore. I love watching their imaginations taking them away into another world and the story that comes with the drawings. I love to watch them draw, to work side by side, to see the creativity and know that no technology had any part in it. I love waiting to see their creations and trying to see through their eyes what beautiful works of art they have painted through their doodling. I love seeing my daughter coloring and designing her insightful pictures. The Doodle Magic is too awesome to miss this opportunity! Their use of imagination and drawing things without differentiating between girl colours or boy colours – they just love colours and the opportunity to draw. I love watching the concentration that enable the imagination to flow. I love the squiggly shapes starting to look like what’s intended! Mr just 3 is very good at giraffes – with babies!!! I love to watch my daughter draw because she is very creative for a six year old and includes so much detail in her pictures. love watching their little faces, take it so seriously, only time i see concentration and tongues sticking out, they are so proud of their masterpieces. It’s state of the ART! I love watching them draw, it’s the WRITE stuff whatever they do, and looks good on PAPER! It’s a wonderful way to see how their brain/imagination works as their ability to copy it and display it on paper is amazing. my princess draw her bffs. While she fondly refers to each by name! I love watching their faces scrunch up as they concentrate not to draw or colour outside the lines, they make the most adorably cute faces when they do that. I love it when any children draw as it sparks their imagination and mine! How awesome is this product!!! I know my little girl would love it. She is really starting to develop a keen interest in drawing and it’s so delightful watching her. creates adventurous , happy adults. I love watching my daughter’s face light up when she is drawing a picture (well what she thinks is a picture) lol . She loves drawing every where walls couch ect 🙂 love her to death. Love my son’s facial expressions as he draws and the way gestures for me to draw with him, I cherish these moments. I love watching my 5yr old explain to me exactly what it is he has drawn after he has finished, if he didn’t I would have no idea, although most of the time it’s monsters or aliens! Their creativity , excitement and inspiration process seeing what will they come up with next is a joy and anyones guess! Watching my daughter draw give me so much joy. The excitement in her eyes, her body movements and the singing she does is heartwarming. She will spend hours drawing pictures for every family member. If we are going to visit someone they are sure to get a drawing too! I love watching my 2yr old son draw because Even though it only looks like scribble to us to him it’s a dinosaur or a dog or anything his imagination thinks of. I write on the picture the date and what the picture is, for great keep sakes. I love watching the focus, concentration and excitement on my daughters face when she sees what she has created. She would love one of these so that she can keep creating over and over again. Just to see my girl pick up a texter to draw with will make me a very excited mummy (she’s 5 months now). I love watching them get creative, make stories and have so much fun doing something so simple. I hope it is an activity that they never stop!!! Creating a story, setting the scene, drawing characters & putting voices to them. Watching their imaginations & enthusiasm grow. they can sit there for quite a while. bringing their imagination to life, only to clean it with a sponge. My children use drawing as a way to show their feelings and even hopes and dreams. So innocent and amazing, they are inspirational!! Watching my 16m old trying to copy her big sister colour in is hilarious!! Tongue out, head to the paper! Beautiful moments created! Because there is nothing like watching children explore their imagination and the look of pride when they create a ‘masterpiece’. Through their pictures I get an insight into the world through their eyes…I am constantly amazed and surprised by what I see. I love watching my son’s face light up as he draws. It’s incredible that something as simple as drawing brings so much enjoyment. Watching the progress from month to month, listening to the stories unravel as they draw, seeing the pride as they hand over the masterpiece. Love watching them experiment with colours and textures, having fun and knowing they are learning along the way! I love watching his creativity in his eyes; his confidence grow and finally I love seeing how HE veiws the beautiful world around him. Watching them grow through art. Not just their skill in making a picture, or their physical ability to hold a crayon, but also how their perception of the world grows too. My oldest son is 20 months old and LOVES to color. My favorite part about watching him color is the joy the envelopes his whole face as he creates his own little master pieces. Its contagious. I smile as much as he does! I love the concentration on my grandchildrens faces while they are drawing .